So - you need a loan. It might be for some home improvements, a new family car or the holiday of a lifetime. You need an injection of cash for this, and a loan is perfect for getting your hands on such money relatively quickly. But where you should go to borrow the funds and how much do you understand about loans and interest rates? This beginner's guide should help. Loans can vary, and there are several different types of product available. A personal loan is also known as an unsecured loan, because it's not secured against your house or any other type of asset. A secured loan is often considered more suitable when larger amounts are needed; secured loans are commonly used for significant projects, like a home extension. Secured loans are good options for homeowners who have a decent level of equity in their property and are prepared to secure the debt against their home. Of course, the risk here is obvious and high - you could literally end up losing the roof above your head. With a personal or unsecured loan, you can borrow up to £25,000 and the longest amount of time you have to repay the money back is ten years. With a secured loan, you can borrow more. Much more, in fact - up to £100,000 and that, plus the interest, has to be paid back within 25 years. However, one of the biggest obstacles for many people applying for a loan is that both personal and unsecured loans require a good credit score - and not everyone has a good credit rating. A credit score is how lenders will assess your ability to pay back the loan; if you have a bad credit history you may struggle to get a loan. If you've had problems with a credit card, or a loan, defaulted on payments or experienced financial difficulties, there's a chance your credit history is not a positive one. Many customers have limited access to funds from mainstream financial institutions and may find their application for a loan declined. There are still options for such customers. 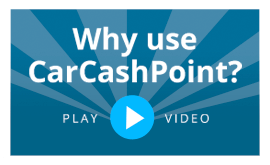 A logbook loan from Car Cash Point is an ideal solution for someone who needs access to money quickly, without the need for a credit check; no formal credit checks take and bad credit is accepted. There are also no hidden penalties or charges. All lenders charge interest rates on their loans, which means not only do you pay back the amount of money you borrowed in the first place but also the interest accrued on that sum. However, as well as considering the APR - Annual Percentage Rate - on any loan, look for other terms and conditions too. For example, with a Car Cash Point loan you can make penalty free overpayments and you only pay interest on the reduced balance. You can also repay in weekly or monthly instalments. There are no early repayment penalties.